Do you like the anise flavor? Many people frown upon hearing the word "anise." They are probably thinking about the licorice. As with many flavor molecules, a family of complex phenolic compounds is responsible for the anise-like flavor. There really are a lot of anise-flavored ingredients and processed foods and drinks: anise, star anise, fennel, fennel seeds, pernod, five spice powder. And then there's tarragon, or French tarragon. The other kind of tarragon -- Russian or wild tarragon -- does not taste the same and is not really used in cooking. Tarragon has a wonderful mellow flavor. After cooking, its anisy character takes on a smoother feel. 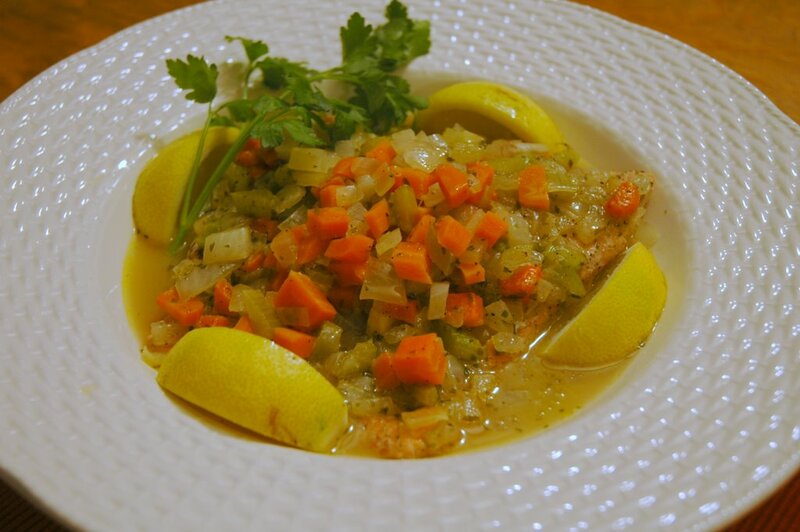 This dish is a salmon filet, braised and covered in a mixture of diced onions, carrots, and celery that have been cooked with butter and tarragon. The flavor is wonderful. Now we just need to perfect the timing for cooking salmon – it so often comes out on the dry side.